The Republic of Trinidad and Tobago is an archipelagic state in the southern Caribbean, lying northeast of the South American nation of Venezuela and south of Grenada in the Lesser Antilles. It shares maritime boundaries with Barbados to the northeast and Guyana to the southeast. The country covers an area of 1,979 square miles (5,128 sq km) and consists of two main islands, Trinidad and Tobago, and 21 smaller islands. Trinidad is the larger and more populous of the main islands; Tobago is much smaller, comprising only about six percent of the total area and four percent of the population. The nation lies outside the hurricane belt. Originally settled by Amerindians of South American origin at least 7,000 years ago, the islands were occupied by Arawakan- and Cariban-speaking peoples at the time of European contact in 1498. The current population is a blend of African, Indian, European, Middle Eastern and Chinese people, many who settled the islands through the systems of slavery and indentureship, common to the entire Caribbean history. All these groups have left an imprint on the national culture, and there is an increasingly high percentage of mixed-race people. Trinidad and Tobago became an independent nation (from the United Kingdom) in 1962 and a republic in 1976. Officially Trinidadians or Tobagonians, the people from Trinidad and Tobago are often informally referred to as Trinidadian or Trinis. Unlike most of the English-speaking Caribbean, Trinidad and Tobago is a primarily industrialized country whose economy is based on petroleum and petrochemicals. The nation is famous for its pre-Lenten Carnival and as the birthplace of steelpan, calypso, and the limbo. The capital city, Port-of-Spain, is a leading candidate to serve as the headquarters of the Permanent Secretariat of the anticipated Free Trade Area of the Americas (FTAA-ALCA). Trinidad and Tobago is an archipelagic republic consisting of 23 islands in the southern Caribbean between the Caribbean Sea and the North Atlantic Ocean, northeast of Venezuela. They are southeasterly islands of the Lesser Antilles, located close to the South American mainland. Covering an area of 1,979 square miles (5,128 square kilometers), the country consists of the two main islands, Trinidad and Tobago, and 21 smaller islands—including Chacachacare, Monos, Huevos, Gaspar Grande (or Gasparee), Little Tobago, and St. Giles Island. 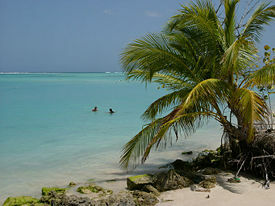 Trinidad is 7 mi (11 km) off the northeast coast of Venezuela and 81 miles (130 km) south of the Grenadines. The island measures 1,841 sq mi (4,768 km²) in area (comprising 93.0 percent of the country's total area) with an average length of 50 mi (80 km ) and an average width of 37 mi (59 km). The island appears rectangular in shape with three projecting peninsular corners. Tobago is 19 mi (30 km) northeast of Trinidad and measures about 115 sq mi (298 km²) in area, or 5.8 percent of the country's area, 32 mi (51.5 km) in length and 11 mi (17.7 km) at its greatest width. The island is cigar-shaped in appearance, with a northeast-southwest alignment. Geologically, the islands are not part of the Antillean arc. Rather, Trinidad was once part of the South American mainland and is situated on its continental shelf, and Tobago is part of a sunken mountain chain related to the continent. The islands are now separated from the continent of South America by the Gulf of Paria; Dragon's Mouth, a 12 mile (19 km) wide northern passage; and Serpent's Mouth, a 9 mile (14 km) wide southern passage. Trinidad is traversed by three distinct mountain ranges that are a continuation of the Venezuelan coastal cordillera. The Northern Range, an outlier of the Andes Mountains of Venezuela, consists of rugged hills that parallel the coast. This range rises into two peaks. The highest, El Cerro del Aripo, is 3,084 ft (940 meters high); the other, El Tucuche, reaches 3,071 ft (936 meters). The Central Range extends diagonally across the island and is a low-lying range with swampy areas rising to rolling hills; its maximum elevation is 1,066 ft (325 meters). The Caroni Plain, composed of alluvial sediment, extends southward, separating the Northern Range and Central Range. The Southern Range consists of a broken line of hills with a maximum elevation of 1,000 ft (305 meters). There are numerous rivers and streams on the island of Trinidad; the most significant are the Ortoire River, 31 mi (50 km) long, which extends eastward into the Atlantic, and the 25 mi (40 km) long Caroni River, reaching westward into the Gulf of Paria. Most of the soils of Trinidad are fertile, with the exception of the sandy and unstable terrain found in the southern part of the island. Tobago is mountainous and dominated by the Main Ridge, which is 18 mi (29 km) long with elevations up to 2,100 ft (640 m). There are deep, fertile valleys running north and south of the Main Ridge. The southwestern tip of the island has a coral platform. Although Tobago is volcanic in origin, there are no active volcanoes. Forestation covers 43 percent of the island. There are numerous rivers and streams, but flooding and erosion are less severe than in Trinidad. The coastline is indented with numerous bays, beaches, and narrow coastal plains. Tobago has several small satellite islands. The largest of these, Little Tobago, is starfish-shaped, hilly, and consists of 1.2 km² of impenetrable vegetation. Trinidad and Tobago, well within the tropics, both enjoy a generally pleasant maritime tropical climate influenced by the northeast trade winds. In Trinidad the annual mean temperature is 26 °C, and the average maximum temperature is 33 °C. The humidity is high, particularly during the rainy season, when it averages 85 to 87 percent. The island receives an average of 83 in (211 cm) of rainfall per year, usually concentrated in the months of June through December, when brief, intense showers frequently occur. Precipitation is highest in the Northern Range, which may receive as much as 150 in (381 cm). During the dry season, drought plagues the island's central interior. Tobago's climate is similar to Trinidad's but slightly cooler. Its rainy season extends from June to December; the annual rainfall is 250 centimeters. The islands lie outside the hurricane belt; despite this, Hurricane Flora damaged Tobago in 1963, and Tropical Storm Alma hit Trinidad in 1974, causing damage before obtaining full strength. Having once been part of the South American continent, Trinidad and Tobago has some of the richest natural communities in the Caribbean. Unlike most of the islands, they support a primarily South American flora and fauna; considerably more varied than that of most West Indian islands. However, rates of endemism are lower than in the rest of the region because most of the species in Trinidad and Tobago are also found on the South American mainland. There are over 100 species of mammals, a large percentage of them being bats. Carnivorous mammals include the Ocelot, the Tayra, the Crab-eating Raccoon and the Neotropical River Otter. Large herbivores include the Red Brocket, the Collared Peccary and the highly endangered West Indian Manatee (a few of which persist in the ecologically diverse Nariva Swamp on Trinidad's east coast). The Red Howler Monkey and the White-fronted Capuchin are the country's two native primate species. The Silky Anteater and its relative the Tamandua are two of the most bizarre creatures of Trinidad's forests. Other small to medium sized mammals present include the agouti, the paca, the prehensile-tailed porcupine, the Nine-banded Armadillo and a few species of opossum. A number of small rodents including a species of squirrel are native to the islands. 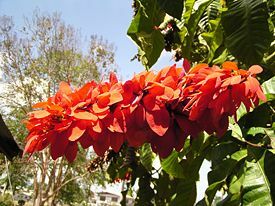 The Chaconia flower is the national flower of Trinidad and Tobago. An abundance of birds, 468 species, have been recorded in Trinidad and Tobago. There are few places in the world where so many birds can be seen in such a small area, and many of them are unique, very rare, or of particular interest. They range from the many species of hummingbird to the primitive cave-dwelling oilbird (that uses sonar to fly in the dark) to the spectacularly beautiful Scarlet Ibis. Snakes abound, as do various reptiles, such as lizards ranging in size from just over an inch or two in length to the huge six-foot long Green Iguana. Geckos, Terrapins, tortoises and turtles make their homes here. The Spectacled Caiman, which may grow up to about eight feet in length, shares its habitat in the Nariva Swamp on Trinidad's east coast with the mighty Green Anaconda. A number of frogs and toads inhabit the islands, including the well known huge Marine or Cane Toad locally known as the Crapaud (pronounced crah-poh) and the tiny, colorful, rare endemic species known as the Golden Tree Frog which is found only in the giant epiphitic bromeliads at the summits of Trinidad's two highest peaks. Trinidad and Tobago are extremely rich in neotropical invertebrate fauna. Several hundred species of butterflies (including the brilliant blue Emperor Butterfly) and beetles are to be found in the Tropical Forests of the islands. The largest specimens of centipedes (over 10 inches long) may be found particularly in the drier forests of the Northwestern Peninsular of Trinidad (the Chaguaramas Peninsular) as well as the nearby tiny off shore islands. The insect life of Trinidad and Tobago has not been well-studied and it is an entomologist's paradise waiting to be discovered, with many species remaining undocumented. Human settlement in Trinidad dates back at least 7,000 years, beginning with settlement of the islands by Amerindians. Termed Archaic or Ortoiroid, they are believed to have settled Trinidad from northeastern South America around 5000 B.C.E. Twenty-nine Archaic sites have been identified, mostly in south Trinidad; this includes the 7,000-year-old Banwari Trace site which is the oldest human settlement in the eastern Caribbean. Archaic populations were pre-ceramic, and dominated the area until about 200 B.C.E. Around 250 B.C.E. the first ceramic-using people in the Caribbean, the Saladoid people, entered Trinidad. Earliest evidence of these people come from around 2100 B.C.E. along the banks of the Orinoco River in Venezuela. From Trinidad they are believed to have moved north into the remaining islands of the Caribbean. Thirty-seven Saladoid sites have been identified in Trinidad, and are located all over the island. After 250 C.E. a third group, called the Barrancoid people settled in southern Trinidad after migrating up the Orinoco River toward the sea. The oldest Barrancoid settlement appears to have been at Erin, on the south coast. Around 1300 C.E. a new group appears to have settled in Trinidad and introduced new cultural attributes which largely replaced the Guayabitoid culture. Termed the Mayoid cultural tradition, this represents the native tribes which were present in Trinidad at the time of European arrival. Their distinct pottery and artifacts survive until 1800, but after this time they were largely assimilated into mainstream Trinidad society. These included the Nepoya and Suppoya (who were probably Arawak-speaking) and the Yao (who were probably Carib-speaking). They have generally been called Arawaks and Caribs. Both peoples were largely wiped out by the Spanish colonizers who enslaved and attempted to Christianize them. The survivors were organized into Missions by the Capuchin friars, and gradually assimilated. The oldest organized indigenous group in Trinidad is the Santa Rosa Carib Community centered in the town of Arima, although several new groups have developed in recent years. First contact with Europeans, led by Christopher Columbus, took place on July 31, 1498. Columbus is reported to have promised to name the next land he discovered for the Holy Trinity, thus the name Trinidad. Amerindians in Trinidad were initially classified as friendly. The location of Trinidad between the Island Caribs (or Kalinago) of the Lesser Antilles and those of the South American mainland made the island prone to slave raiding even before Spanish settlement and a more warlike population than was found among their Taino Arawak kin in the Greater Antilles. In 1553, Juan Sedeño was authorized to settle Trinidad, but the contract was never fulfilled. In 1569, Juan Troche Ponce de León built the "town of the Circumcision," probably around modern Laventille. In 1570, this settlement was abandoned. In 1592, Antonio de Berrio established the first lasting settlement, the town of San José de Oruña (the modern St. Joseph). Missions were established as part of the Spanish colonization. In 1687, the Catalonian Capuchin friars were given responsibility for the conversion of the indigenous population of Trinidad and the Guianas. In 1713 the missions were handed over to the secular clergy. Due to shortages of missionaries, although the Missions were established they often went without Christian instruction for long periods of time. Tensions between priests and Amerindians led to the Arena Massacre of 1699, wherein the Amerindians murdered the priests. After being hunted by the Spanish, the survivors are reported to have committed suicide by jumping off cliffs into the sea. Although Spanish settlement began in the sixteenth century, the population in 1783 was less than 3,000, the majority being Amerindians. In 1783, the proclamation of a Cedula of Population by the Spanish Crown granted 32 acres (129,000 m²) of land to each Roman Catholic who settled in Trinidad and half as much for each slave that they brought. Uniquely, 16 acres (65,000 m²) was offered to each Free Coloured or Free Person of Colour (gens de couleur libre, as they were later known), and half as much for each slave they brought. In the tumult of the Haitian and French Revolutions, many people migrated from the French islands to Trinidad. This resulted in Trinidad having the unique feature of a large French-speaking Free Coloured slave-owning class. In the census of 1777 there were only 2,763 people recorded as living on the island, including some 2,000 Arawaks. By the time the island was surrendered to the British in 1797 the population had increased to 17,643: 2,086 whites, 1,082 free people of colour, 1,082 Amerindians, and 10,009 African slaves. By 1960, the population was 827,957 and included no Amerindians. Spanish rule over the island, which nominally began in 1498, ended when the final Spanish Governor, Don José María Chacón, surrendered the island to a British fleet of 18 warships under the command of Sir Ralph Abercromby on February 18, 1797. 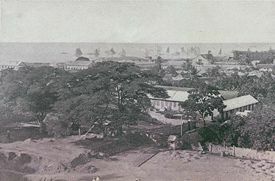 Tobago's development was similar to other plantation islands in the Lesser Antilles and quite different from Trinidad's. Trinidad was formally ceded to Britain in 1802, and its development as a sugar colony continued. Tobago was almost untouched by European settlers until the eighteenth century. Its development as a sugar colony began in 1763 when it was ceded to Britain. It continued to produce sugar during the many times it changed hands between France and Britain. In 1899, Tobago became a ward of Trinidad and by then its importance as a sugar colony had long since passed. When the slave trade was prohibited in 1806-1807, along with the eventual abolition of slavery in 1834, labor shortages became a big problem on the island and plantation owners had to look elsewhere for labor. In 1845 Trinidad began to introduce indentured laborers from India, which continued until 1917. Indentured laborers eventually established themselves and many of them remained on the island and have become a major influence in the culture and identity of Trinidad. Trinidad demonstrated one of the first successful uses of non-violent protest and passive resistance almost a hundred years before Mahatma Gandhi's campaign in India. On August 1, 1834, an unarmed group of mainly elderly Negroes being addressed by the Governor at Government House about the new laws, began chanting: "Pas de six ans. Point de six ans" ("Not six years. No six years"), drowning out the voice of the Governor. Peaceful protests continued until a resolution to abolish apprenticeship was passed and de facto freedom was achieved. This may have been partially due to the influence of Dr. Jean Baptiste Phillipe's book, A Free Mulatto, published in 1824. At the request of Governor, Sir George Fitzgerald Hill, "on July 25th, Dr. Jean Baptiste Phillipe, the first colored member of the Council, proposed a resolution to end apprenticeship and this was passed. On the 1 August 1838 emancipation which had theoretically been granted to the slaves in 1834 became a reality. Full emancipation for all was finally legally granted ahead of schedule on 1 August, 1838." The year 1838 also saw the abolition of the "apprenticeship" system in Jamaica, Barbados, and the Leeward and Windward Islands. The sugar plantations which dominated the economy of Trinidad in the nineteenth century gradually gave ground to the cultivation of cacao. Trinidadian chocolate became a high-priced, much sought-after commodity. The Colonial government opened land to settlers interested in establishing cacao estates. French Creoles were being marginalized economically by large English business concerns who were buying up sugar plantations, and this gave them a fresh avenue of economic development. The mostly Hindu and Muslim indentured laborers who were brought to the islands were compelled to work seven and a half hours a day, six days a week for three years, receiving about 13 cents a day for their work. At first, half of the recruits were women but, in 1840, the proportion was reduced to a third of the number of men. In 1844, the period of indenture was extended to five years with a guarantee that, if they wished, they would get a free passage home at the end of their service. In 1853 the law was again amended to allow the indentured laborers to re-indenture themselves for a second five-year term or, if they wished, to commute any portion of their contract by repayment of a proportionate part of their indenture fee. Many Indian immigrants who had completed their indentureship also established cocoa estates, most notable of them being Haji Gokool Meah, a Kashmiri-born immigrant who went on the become one of the wealthiest men in Trinidad. The Indian community has steadily prospered and grown until it makes up about 41 percent of the population of the nation, the largest ethnic group by about one percent. The arrival of witches' broom and black pod diseases in the 1930s, coupled with the Great Depression, destroyed the Cacao industry in Trinidad. Although prices for Trinidad cocoa beans remains high on the world markets, cocoa is no more than a marginal crop. The remaining plantations in Tobago were almost wholly destroyed by Hurricane Flora 1963. In 1893 Randolph Rust, along with his neighbor, Lee Lum, drilled a successful oil well. By early 1907 major drilling operations began, and roads and infrastructure were built. Annual production of oil in Trinidad reached 47,000 barrels by 1910 and kept rapidly increasing year by year. Estimated oil production in Trinidad in 2005 was about 150,000 bbl/day. Today oil is a major industry in Trinidad and Tobago. Trinidad was ruled as a crown colony with no elected representation until 1925. Although Tobago had an elected Assembly, this was dissolved prior to the union of the two islands. In 1925 the first elections to the Legislative Council were held. Seven of the thirteen members were elected, while the others were nominated by the Governor. The franchise was determined by income, property and residence qualifications, and was limited to men over the age of 21 and women over the age of 30. The 1946 elections were the first with universal adult suffrage. Labor riots in 1937 led by Tubal Uriah Butler shook the country and led to the formation of the modern trade union movement. Butler was jailed from 1937 to 1939, and was re-arrested when the United Kingdom entered World War II and jailed for the duration of the war. After his release in 1945 Butler reorganized his political party, the British Empire Citizens' and Workers' Home Rule Party. This party won a plurality in the 1950 General Elections, but the establishment feared Butler as a radical and instead Albert Gomes became the first Chief Minister of Trinidad and Tobago. In 1958, the United Kingdom attempted to establish an independent West Indies Federation comprising most of the former British West Indies. However, disagreement over the structure of the federation led to Jamaica's withdrawal. Eric Williams responded to this with his now famous calculation "One from ten leaves nought." Trinidad and Tobago chose not bear the financial burden without Jamaica's assistance, and the Federation collapsed. Trinidad and Tobago achieved full independence in August 1962 within the Commonwealth with Queen Elizabeth II as its titular head of state. On August 1, 1976, the country became a republic, and the last Governor-General, Sir Ellis Clarke, became the first President. The high oil prices of the 1970s and early 1980s led to an oil boom which resulted in a large increase in salaries, standards of living, and political corruption. In July 1990, the Jamaat al Muslimeen, an extremist Black Muslim group with an unresolved grievance against the government over land claims, tried to overthrow the NAR government. The group held the prime minister and members of parliament hostage for five days while rioting shook Port of Spain. After a long standoff with the police and military, the Jamaat al Muslimeen leader, Yasin Abu Bakr, and his followers surrendered to Trinidadian authorities. Having had the matter referred back to the local courts by the Privy Council with a clear indication of a view that the amnesty was valid, in July 1992, the High Court upheld the validity of a government amnesty given to the Jamaat members during the hostage crisis. Abu Bakr and 113 other Jamaat members were jailed for two years while the courts debated the amnesty's validity. All 114 members were eventually released. Subsequent to this, the UK Privy Council deemed the amnesty invalid but expressed the view that it would be improper to re-arrest the 114 accused. In December 1991, Patrick Manning became the new Prime Minister and Basdeo Panday continued to lead the opposition. In November 1995, Manning called early elections, in which the PNM and UNC both won 17 seats and the NAR won two seats. The UNC allied with the NAR and formed the new government, with Panday becoming prime minister—the first prime minister of Indo-Trinidadian descent. Elections held in December 2000 returned the UNC to power when they won 19 seats, while the opposition PNM won 16, and the NAR 1. The UNC government fell in October 2001 with the defection of three of its parliamentarians amidst allegation of corruption in the then UNC government, and the December 2001 elections resulted in an even 18 to 18 split between the UNC and the PNM. President Robinson appointed Patrick Manning Prime Minister despite the fact that the UNC won the popular vote and that Panday was the sitting Prime Minister. Despite the fact that Manning was unable to attract a majority (and Parliament was thus unable to sit), he delayed calling elections until October of 2002. The PNM formed the next government after winning 20 seats, while the UNC won 16. Both parties are committed to free market economic policies and increased foreign investment. The country is cooperative with the United States in the regional fight against narcotics trafficking and on other issues. Trinidad and Tobago is a liberal democracy with a two-party system and a bicameral parliamentary system based on the Westminster System. The Head of State is the President while the Head of Government is the Prime Minister. The President is elected by an Electoral College consisting of the full membership of both houses of Parliament. The Prime Minister is appointed by the President. The President is required to appoint the leader of the party who in his opinion has the most support of the members of the House of Representatives to this post; this has generally been the leader of the party which won the most seats in the previous election (except in the case of the 2001 General Elections). The Parliament consists of two chambers, the Senate (31 seats) and the House of Representatives (36 seats, will increase to 41 seats after the next election). The members of the Senate are appointed by the president. Sixteen Government Senators are appointed on the advice of the Prime Minister, six Opposition Senators are appointed on the advice of the Leader of the Opposition and nine Independent Senators are appointed by the President to represent other sectors of civil society. The 36 members of the House of Representatives are elected by the people for a maximum term of five years. Since December 24, 2001, the governing party has been the People's National Movement led by Patrick Manning; the Opposition party is the United National Congress led by Kamla Persad-Bissessar (Leader of the Opposition). Support for these parties appears to fall along ethnic lines with the PNM consistently obtaining a majority Afro-Trinbagonian vote, and the UNC gaining a majority of Indo-Trinbagonian support. Trinidad and Tobago is a leading member of the Caribbean Community (CARICOM) and the CARICOM Single Market and Economy (CSME). It is also the Seat of the Caribbean Court of Justice (CCJ), which was inaugurated in April 2005. The CCJ is intended to replace the British Privy Council as the final Appellate Court for the member states of the CARICOM. Since its inauguration, only two states, Barbados and Guyana, have acceded to the appellate jurisdiction of the CCJ. Trinidad's economy is strongly influenced by the petroleum industry. Tourism and manufacturing are also important to the local economy. Tourism is a growing sector, although not proportionately as important as in many other Caribbean islands. The economy benefits from low inflation and a trade surplus. Agricultural products include the prominent crop sugar cane, as well as citrus, cocoa, and other products. Sound macroenconomic practices by the government produced nine straight years of real growth (3.2 percent in 2002, for example). Long-term growth looks promising, as Trinidad and Tobago further develops its hydrocarbon, petrochemical, and metals sectors—with significant increases in exports. Diversification efforts include services, tourism, manufacturing, and agriculture. Trinidad and Tobago's strong growth rate over the past few years has led to trade surpluses over the past four years, even with high import levels due to industrial expansion and increased consumer demand. The debt service ratio was a moderate 4.7 percent in 2004, and fell to 2.5 percent in 2005. In 2006, unemployment fell to 5 percent, down from 6.7 percent in 2005. Trinidad and Tobago is the fifth largest exporter of liquefied natural gas (LNG) in the world. The expansion of Atlantic LNG over the next four years could create the largest single sustained phase of economic growth in Trinidad and Tobago. It has become the leading exporter of LNG to the United States, and now supplies some 70 percent of U.S. LNG imports. The nation is experiencing a transition from an oil-based economy to a natural gas-based economy. Reductions in subsidies to state enterprises have contributed to fiscal soundness and lent credibility to the government's ongoing divestment program. The government is currently considering creating a holding company to bring its remaining shares in several formerly wholly government-owned enterprises to market. Trinidad and Tobago's infrastructure is adequate by regional standards. The national airport has recently been expanded. There is an extensive network of paved roads, and utilities are fairly reliable in the cities. Some areas, however, especially rural districts, continue to suffer from water shortages, power failures, and inadequate drainage. Some companies presently constructing large industrial plants at the Point Lisas Industrial Estate in central Trinidad are concerned that water supply to their plants will not be adequate. The government is addressing this problem with the construction of a desalinization plant. Infrastructure improvement, especially rural roads and bridges, rural electrification and telephone service, and drainage and sewerage, are among the government's budget priorities, and are generously supported by the multilateral development agencies and the European Union. The government's economic strategy is based on fiscal and monetary discipline, private sector investment, and export-led growth. Trinidad has 1,056,608 (July 2007) inhabitants, most of whom (96 percent) reside on the island of Trinidad with most of the remaining (4 percent) living in Tobago. The ethnic composition of Trinidad and Tobago reflects its history of conquest and immigration. Two major ethnic groups - Indo-Trinidadians and Afro-Trinidadians - account for almost 80 percent of the population, while people of Mixed-race, Euro-Trinidadian/European, Sino-Trinidadian/Chinese and Arab-Trinidadian/Syrian-Lebanese descent make up most of the rest of the population. According to the 1990 census, Indo-Trinidadians made up 40.3 percent of the population, Afro-Trinidadians 39.5 percent, Mixed-race people 18.4 percent, Euro-Trinidadian 0.6 percent and Chinese, Syrians, and others 1.2 percent. Euro-Trinidadians, especially those descendants of the former plantocracy, are often referred to as French Creoles, whether they are descended from Spanish, British, or German settlers. The mixed-race Cocoa Payols are descendant of the original Spanish settlers and later immigrants from Venezuela. Today, the Trinidadian Portuguese population includes both whites and mixed people. The small Amerindian population is largely mixed-race. The Carib population, which is descendant of the indigenous inhabitants, is primarily organized around the Santa Rosa Carib Community. Emigration from Trinidad and Tobago, as with other Caribbean nations, has historically been high; most emigrants go to the United States, Canada and Britain. Emigration has continued, albeit at a lower rate, even as the birth rate sharply dropped to levels typical of industrialized nations. Largely because of this phenomenon, as of 2007, Trinidad and Tobago has the second lowest population growth rate in the world (-0.883 percent (2007 est. ), behind Cook Islands. English is the country's only official language, but Bhojpuri, locally known as "Hindi," is also spoken by a few Indo-Trinidadians and widely used in popular music such as chutney and chutney soca. The main spoken language, Trinidadian English is either classified as a dialect or variety of English or as an English Creole (Trinidadian Creole English). The major spoken language in Tobago is Tobagonian Creole English. Both languages contain elements from a number and variety of African languages; Trinidadian English, however, is also largely influenced by French and French Creole and by Bhojpuri/Hindi. The creole languages and other vernaculars are normally spoken in informal situations, and there is not yet a formalized system of writing (other than as in standard English). Although Patois (a variety of French Creole) was once the most widely spoken language, it is now rarely heard. 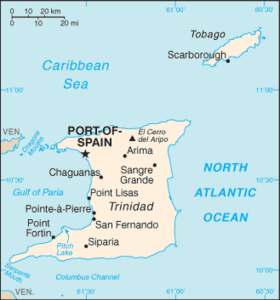 Due to Trinidad's location on the coast of South America, the country has been slowly redeveloping a connection with the Spanish-speaking peoples, but has been impeded by the fact that in 2004, only 1,500 inhabitants spoke Spanish. In 2004 the government initiated the Spanish as a First Foreign Language (SAFFL) initiative with a public launch in March 2005. Government regulations now require Spanish to be taught to all beginning at the primary school level, while 30 percent of public employees are to be linguistically competent within five years. Venezuelans often come to Trinidad and Tobago to learn English, and many English schools have expanded to feature both English and Spanish. The Culture of Trinidad and Tobago reflects the influence of African, Indian, French, Amerindian, Chinese, British, Spanish, Portuguese, Venezuelan, Caribbean, and American culture. Since the histories of Trinidad and Tobago are different, there are differences in the cultural influences which have shaped each island. Despite their small sizes, there are also regional differences within each island. Trinidad and Tobago is an English-speaking country with strong links to both the United Kingdom and the United States. Historical membership in the British Empire left a major influence on the country, including the dominance of the English language and the popularity of the two top sports in the country, football and cricket. The dominance of American television programming and Hollywood movies, together with the presence of a large emigrant population in the United States has resulted in a profound American influence on the culture. It is also the birthplace of calypso music and the steelpan (also called the steel drum), which is widely claimed to be the only acoustic musical instrument invented during the twentieth century. Calypso developed together with Carnival. The chantuelle, who spoke for the band, evolved into the calypsonian (and other characters, such as the Midnight Robber). The music, which drew upon African and French influences, became the voice of the people. It allowed the masses to challenge the doings of the unelected Governor and Legislative Council, and the elected town councils of Port of Spain and San Fernando. As English replaced patois (Creole French) as the dominant language, calypso migrated into English, and in so doing it attracted more attention from the government. Calypso continued to play an important role in political expression, and also served to document the history of Trinidad and Tobago. The diverse cultural and religious background allows for many festivities and ceremonies throughout the year. Other indigenous art forms include soca (a derivate of calypso), Parang (Venezuelan-influenced Christmas music), chutney, and pichakaree (musical forms which blend the music of the Caribbean and India) and the famous Limbo dance. The artistic scene is vibrant. Trinidad and Tobago claims two Nobel Prize-winning authors, V. S. Naipaul and St. Lucian-born Derek Walcott. Mas' designer Peter Minshall is renowned not only for his Carnival costumes, but also for his role in the opening ceremonies of the 1992 Summer Olympics, the 1994 Football World Cup, the 1996 Summer Olympics and the 2002 Winter Olympics, for which he won an Emmy Award. The cuisine of Trinidad and Tobago draws upon the varied origins of its people. Three influences predominate—Creole, Indian and Chinese cuisine. It is also influenced by the blends of Amerindian, European, African, Creole, Chinese, Indian and Lebanese tastes. Creole food commonly includes callaloo, macaroni pie and red beans. Callaloo, a creamy and spicy side dish made of dasheen leaves, ochro (or okra), crab, thyme, coconut milk and shado beni (from "chardon bénit," French thistle or Fitweed) or bhandhanya or culantro. Callaloo is generally considered a national dish of Trinidad and Tobago; it is often prepared for Sunday Lunch and paired with cornmeal coo coo, and sometimes made with crab. Indian food is based on curries. Rote, a flatbread of Indian origin often served with of curried potatoes, channa (chick peas) and meat. Dhalpuri is a type of roti which has a middle layer of ground dhal, or split peas. Other local dishes include aloo choka, coconut bake, stewed (caramelized) chicken, sancoche, macaroni pie and breadfruit oil down. Pelau, a rice-based dish, is also a standard dish. Popular street foods include most importantly doubles, pholourie, geera pork, souse, corn soup, Maracas shark & bake, and black pudding. Although the Chinese element in the population is small, Chinese food is cooked in most homes, and is served in most restaurants. Many different religions are present in Trinidad and Tobago. The largest two are the Roman Catholics (26 percent) and Hindus (22 percent); the Anglicans (8 percent), Muslims (6 percent), Seventh-day Adventists (4 percent), Presbyterians and Methodists are among the smaller faiths. Two African syncretic faiths, the Shouter or Spiritual Baptists and the Orisha faith (formerly called Shangos, a less than complimentary term) are among the fastest growing religious groups, as are a host of evangelical and fundamentalist churches usually lumped as "Pentecostal" by most Trinidadians (although this designation is often inaccurate). 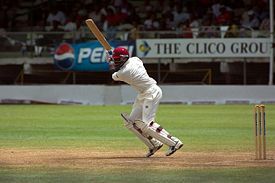 Cricket: Trinidad and Tobago plays both one day international and Test cricket as a member of the West Indies team. The national team plays at the first-class level in regional competitions. Double world record holder for the most runs scored in a Test and First class innings Brian Lara is from Trinidad and Tobago. Football: The national football team qualified for the 2006 FIFA World Cup by beating Bahrain in Manama on 16 November 2005, making them the smallest country ever (in terms of population) to qualify. This was their first successful qualification and brought their ranking to 51st in the world. The team, coached by Dutchman Leo Beenhakker, drew their first group game—against Sweden in Dortmund—0-0, but lost the second game to England on late goals 0-2. Because Scotland did not qualify for the 2006 World Cup, the Tartan Army supported Trinidad and Tobago because they played England, Scotland's arch rival. They were eliminated after losing 2-0 to Paraguay in the final game of the Group Stage. Trinidad and Tobago was host to 2001 FIFA U-17 World Championship. Horse Racing: Trinidad has Santa Rosa Park, a horse racing track. There is also goat racing and crab racing in Tobago. Olympic Games: Hasely Crawford won the first and only Olympic gold medal for Trinidad and Tobago in the men's 100 m dash in the 1976 Summer Olympics. Nine different athletes from Trinidad and Tobago have won 12 medals at the Olympics, beginning with a silver medal in weightlifting, won by Rodney Wilkes in 1948, and most recently, a silver medal by Richard Thompson in the Men's 100m in the 2008 Summer Olympics. Sprinter Ato Boldon has won the most medals for Trinidad and Tobago with four. Sailing: As Trinidad and Tobago is just south of the hurricane belt it is very popular with international cruising yachtsmen, especially from August to October. Consequently there have been a number of repair centers and other facilities developed, the majority of these are situated in Chaguaramas. This international community is also part of the tourism industry along with eco tours and carnival. Dragon boat racing, begun in 2006, has become quite vibrant with competitions to be held throughout the year. The card-game All-Fours is sometimes described as the "Unofficial national sport." All-Fours is known in America as Old Sledge, or Seven Up. ↑ 1.0 1.1 1.2 1.3 Trinidad and Tobago. International Monetary Fund. Retrieved October 22, 2011. ↑ The Carnival Dates Project, Trinidad & Tobago, A brief New-World History. Retrieved August 21, 2007. ↑ A. De Verteuil, Seven Slaves and Slavery: Trinidad 1777-1838: Firmin, Jonas, Zuzule, Daaga, Jacquet, Laurence, Charles (Port of Spain, Trinidad: A. de Verteuil, 1992, ISBN 9768012897). ↑ Petroleum Association of Trinidad, Trinidad's oil; an illustrated survey of the oil industry in Trinidad (Port of Spain: Petroleum Association of Trinidad, 1952, OCLC 2192563). ↑ CIA World Factbook, Trinidad and Tobago. Retrieved August 21, 2007. ↑ U.S. Dept. of State, Background Note: Trinidad and Tobago. Retrieved August 6, 2007. ↑ U.S. Dept. of State, Trinidad and Tobago. Retrieved August 6, 2007. ↑ CIA World Fact book,Population growth rate. Retrieved August 6, 2007. ↑ Government of republic of Trinidad and Tobago, SAFFL Initiative. Retrieved August 6, 2007. ↑ The Independent, Trinidad and Tobago's Olympic gold medal winners. Retrieved August 6, 2007. Besson, Gérard & Bridget Brereton. 1992. The Book of Trinidad, 2nd ed. Port of Spain: Paria Publishing Co. Ltd. ISBN 9768054360. Cudjoe, Selwyn Reginald. 2003. Beyond Boundaries: The Intellectual Tradition of Trinidad and Tobago in the Nineteenth Century. Wellesley, Mass: Calaloux Publications. ISBN 1558493182. De Verteuil, A. 1992. Seven Slaves and Slavery: Trinidad 1777-1838: Firmin, Jonas, Zuzule, Daaga, Jacquet, Laurence, Charles. Port of Spain, Trinidad: A. de Verteuil. ISBN 9768012897. Green, William A. British Slave Emancipation: The Sugar Colonies and the Great Experiment 1830–1865. Oxford: Clarendon. 1976. ISBN 0198224362. Harvard Law School. Corporal punishment in Trinidad and Tobago. Retrieved August 6, 2007. Liverpool, Hollis, 2001. "Chalkdust." Rituals of Power and Rebellion: The Carnival Tradition in Trinidad and Tobago, 1763-1962. Chicago, IL: Research Associates School Times. ISBN 0948390808. History of "Trinidad and Tobago"
This page was last modified on 17 December 2015, at 16:13.